When I decided to re-launch my blog, I knew I wanted to explore the field of fictional detectives. 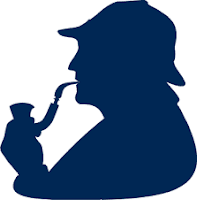 There are so many out there – beginning with perhaps the most famous, Sherlock Holmes. Even non-mystery readers are familiar with Sir Arthur Conan Doyle's intrepid sleuth. In fact, Sherlock has become synonymous with the word detective. I like Sherlock well enough, but tend to be drawn more toward amateur sleuths. Characters like G.K. Chesterton's Father Brown or S.S. Van Dine's Philo Vance. 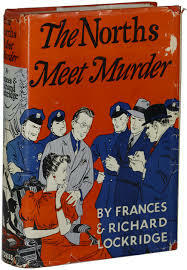 Favorites include Ellery Queen, Lord Peter Wimsey and Nick and Nora Charles. the 1930s. Short vignettes were written by husband and wife team, Frances and Richard Lockridge. Ultimately 26 novels were written, followed by a long-running Broadway production, movie and radio program. Montague Egg: This character appeared in several short stories by Dorothy L. Sayers. A traveling salesman by profession, Montague did not go searching for murders to solve. He typically stumbled upon them by chance. During his adventures, he often quoted from The Saleman's Handbook. Hildegarde Withers: Created by Stuart Palmer, Boston, MA native, Miss Withers is a school teacher who turns amateur sleuth. Palmer's books were published between 1931 and 1954. Reminscent of Agatha Christie's Miss Marple, the character is a umbrella-toting spinster. Several movies were produced in the 1930s. Keep an eye on my Monday posts to discover more about these and other fictional detectives. Got a favorite? Let me know.